A normal varied diet should contain enough zinc foods to supply the body with the required amount of this essential mineral. Taste, smell and skin health are just a few areas of health that require zinc for normal functioning. Men require more zinc than women, as the mineral is lost when a man ejaculates. Seamen has the highest levels of zinc in the body, so therefore the more sexually active a male is, the more zinc they require. Women may require extra zinc if they are breastfeeding, but supplements are rarely needed as zinc overdose is a risk. A good diet containing plenty of vegetables, seeds and nuts will easily provide enough. 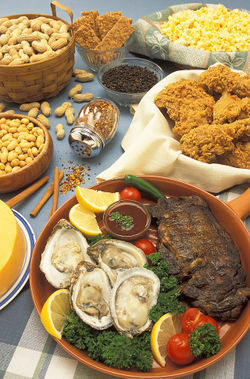 Zinc is present in many foods and some have higher zinc content than others. Zinc found in animal sources is most easily absorbed into the body because most of the zinc found in grains is lost in the milling process. Therefore vegetarians and vegans may have to take zinc supplements. A small amount of zinc supplements can enhance the immune system but larger amounts can suppress the immune system so a physician or dietician should be consulted to assess your individual needs. Zinc is present in every cell in the body and its most important roll is in prostrate gland function and growth and development of the reproductive organs. It is hugely important in the formation of bone and plays a vital role in protecting the liver. It also helps to keep a healthy balance of vitamin E in the blood. As zinc is essential for maintaining a healthy immune system it is therefore an important mineral for the elderly, who could be more vulnerable to infections. Zinc deficiency is also associated with the common vitamin A deficiency symptoms, as zinc assists vitamin A in many of its functions.